The Silky Oaks Lodge • Use the form below to contact us directly. Fill in the fields to check availability & reserve direct with The Silky Oaks Lodge. 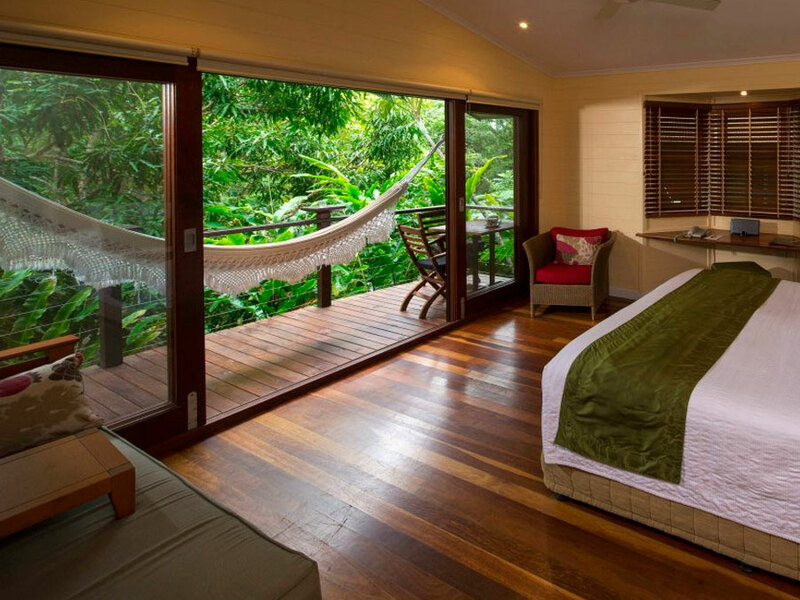 Offering a premier luxury lodge in the Daintree Rainforest, Silky Oaks provides a unique experience in the region and a very comfortable base to explore the rainforest. Only a 15 minute drive from Port Douglas, Silky Oaks is perfectly positioned on the Mossman Gorge River to provide a fantastic and relaxing rainforest experience. 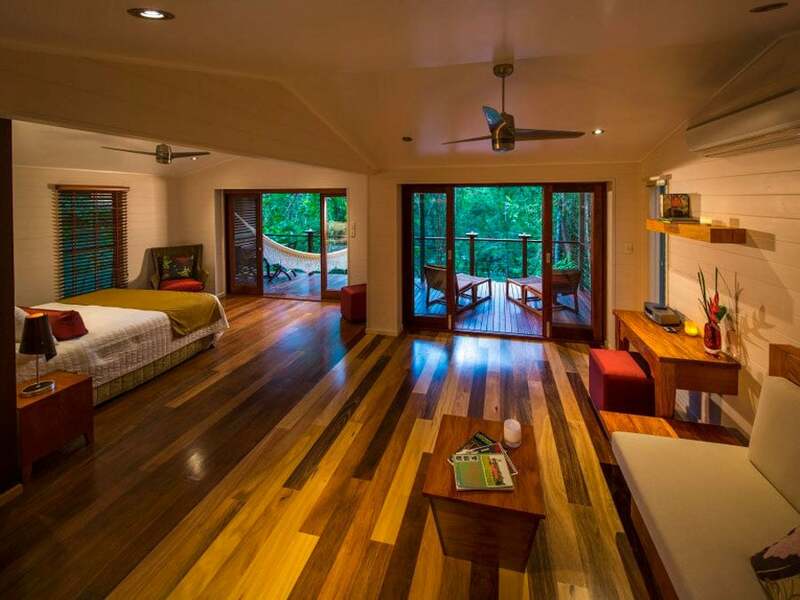 Choose from various rooms and suites in our tree house accommodation, and different package tours to make the most of the Daintree Rainforest and Great Barrier Reef. Located in Far North Queensland, Port Douglas is a relaxed tropical town about 70 km (40 mi) north of Cairns. This is the gateway to the Daintree National Park and also Great Barrier Reef World Heritage areas, but also miles of palm-tree line tropical beach. The town features different boutique hotels and high quality restaurants, and its small size adds an exclusive feel to the tropical climate. Queensland is known for its sunny weather, friendly locals, hot climate, wildlife, reef and rainforest. One of the most incredible areas of Australia, you can enjoy many interesting cities, fantastic nature, tropical rainforest and the Great Barrier Reef. Queensland is split into the lower Queensland area with its sub-tropical, climate and the tropical Far North Queensland for the reef and rainforest. A land of contrasts, Australia is home to lush green rainforest teeming with animals and plants, colorful and exciting marine life, impressive protected areas like the Kakadu National Park, a multitude of culturally significant areas, spectacular waterfalls and lively cities. Australia has many parks and reserves including World Heritage Listed Areas of international significance, such as the well known Great Barrier Reef. Pick your favorite destination and Australia is sure to provide a memorable experience. The Australia most of us know, the vast uninhabited rough and ready landscape of the Australian outback is etched into Australia and crosses every one of Australia’s mainland states. To tour these areas with a guide allows you to travel this harsh environment in safety to learn of the region’s history, cultures, geography and wildlife. Australia is one of the world’s largest countries and is completely surrounded by coastline, which makes for impressive beaches that stretch to the horizon. About half way up the eastern coast of Australia, you will find the world’s largest coral reef system, the Great Barrier Reef. In addition to its golden sandy beaches, the Australian coastline is dotted with thousands of islands where you are sure to find your idyllic tropical island getaway. Some of the picks are Fraser Island, Magnetic Island and the picturesque Whitsundays. A nature lover’s paradise, Australia is home to many protected areas containing outstanding diversity. From the giant Cassowaries in the northern Daintree Rainforest near the beautiful little town of Port Douglas to the Australian icons of Platypus along the eastern side, and of course, the Kangaroos Australia-wide. To tour the rainforest of Cape Tribulation is like stepping into a land forgotten and to combine this with trips to the Great Barrier Reef to see colorful fish and sea turtles, and the Outback were kangaroos bound across the red ground is to experience a land like no other. Welcome to Australia. Our studio rooms give a contemporary and comfortable ambience with luxury en-suite marbled bathroom and a walk-in rain shower. Each of these rooms provide views of the Daintree Rainforest. 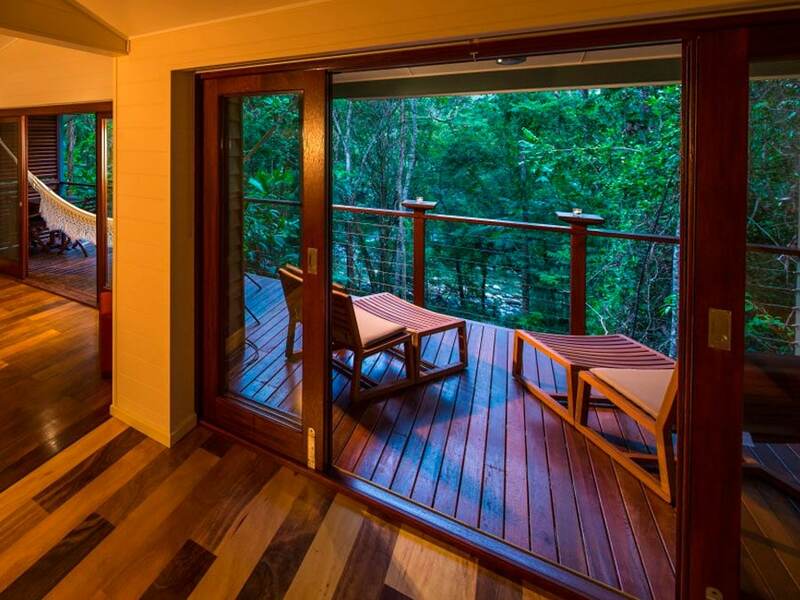 Our Garden rooms have tropically inspired interiors with Rosewood and Silky Oak timber featured throughout. 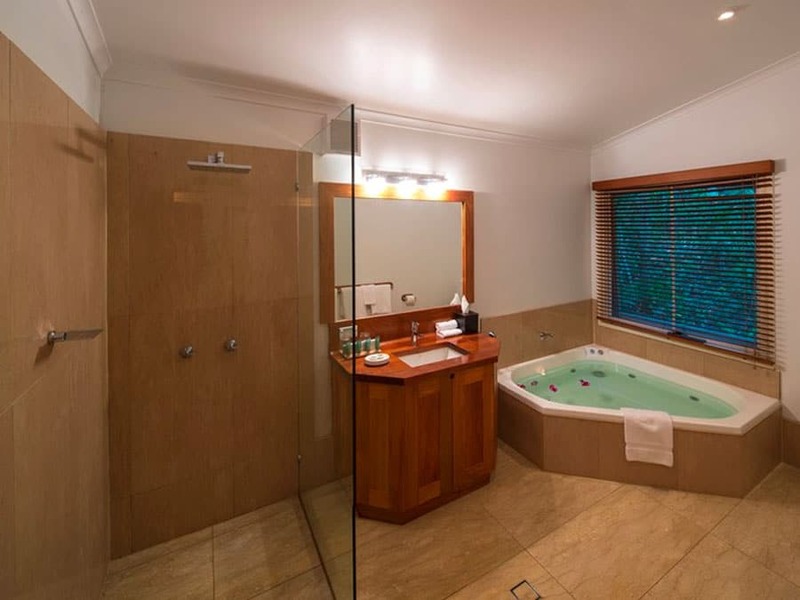 Bathrooms feature separate showers and a large spa bath. 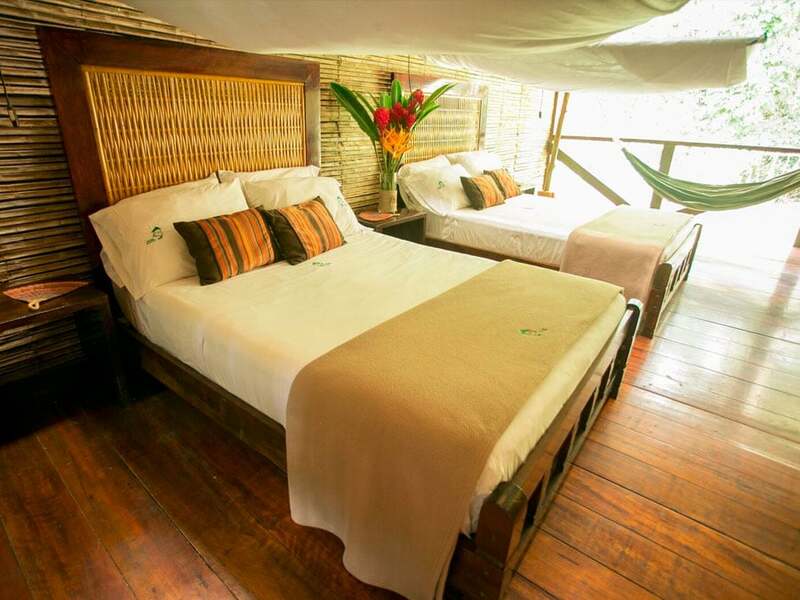 Deluxe Treehouses are high set and elegantly styled with a beautiful private setting in the rainforest and tropical gardens. Set in prime riverfront locations, spectacular rainforest views and the soothing sounds of the Mossman River are key elements of the Riverhouses. The Lodge Suite is a newly refurbished and enlarged Deluxe Treehouse, with open plan lay out. Designer decorated throughout with a contemporary luxury feel. 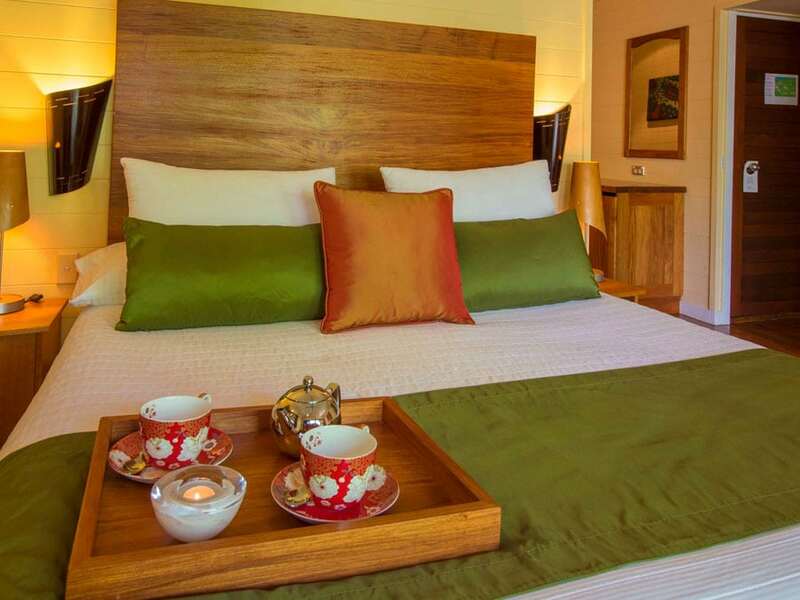 The architecturally designed Billabong Suites are newly refurbished and extended. They feature a separate lounge area with both rooms opening onto a spacious double balcony. Our open sided tree house restaurant gives a fantastic experience of being among nature while enjoying delicious food. You are perched high in the trees with views over the river. The award winning restaurant allows you to sit in the canopy while enjoying a refreshing cocktail at the bar and eating the freshest Australian produce. Enjoy the Healing Waters Spa with Sodashi treatments to give a sense of well-being and spirit of mind. Activities are abundant. Explore the adjacent World Heritage Listed, Daintree National Park, where fauna and flora abound. Enjoy one of our Guided Rainforest Walks or take a picnic and make your own adventure with the guidance of our in-house Trail Guide. Wonder in the breathtaking beauty of the Great Barrier Reef, the world’s largest reef system and choose from our package tours further down. Note: Charges apply, some activities are subject to weather conditions. Enjoy our pre-designed package tour options to help you maximize your experience of this fantastic destination. 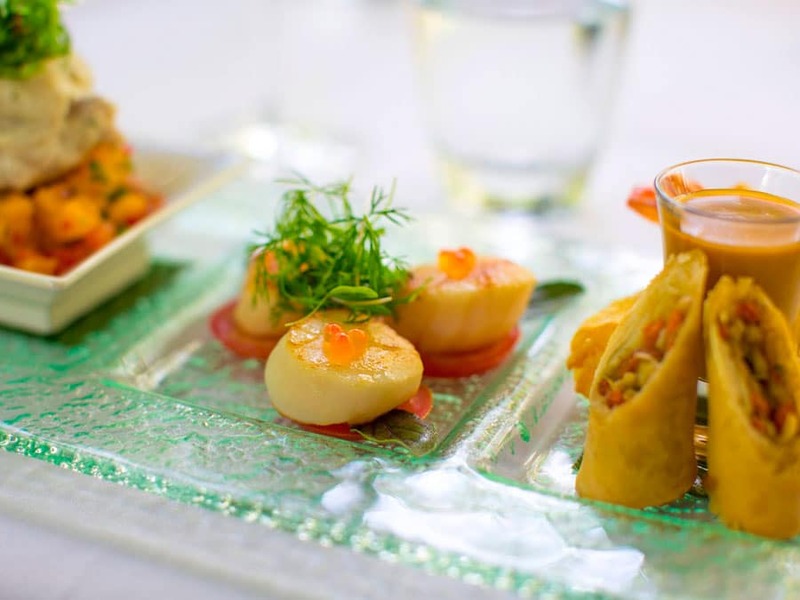 Enjoy two nights in luxury accommodation including gourmet breakfast and two course a la carte dinner each evening. 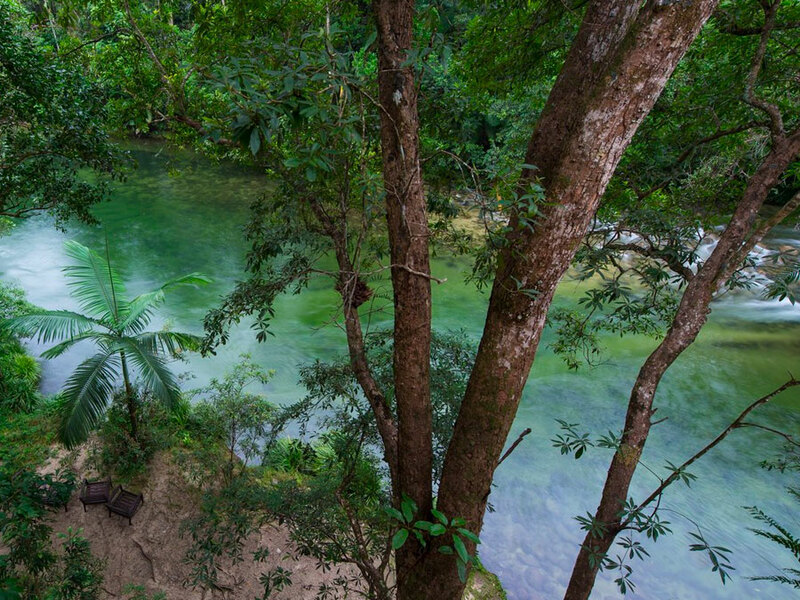 The Kuku Yalanji Dreamtime guided walk through the Mossman Gorge will inspire you. 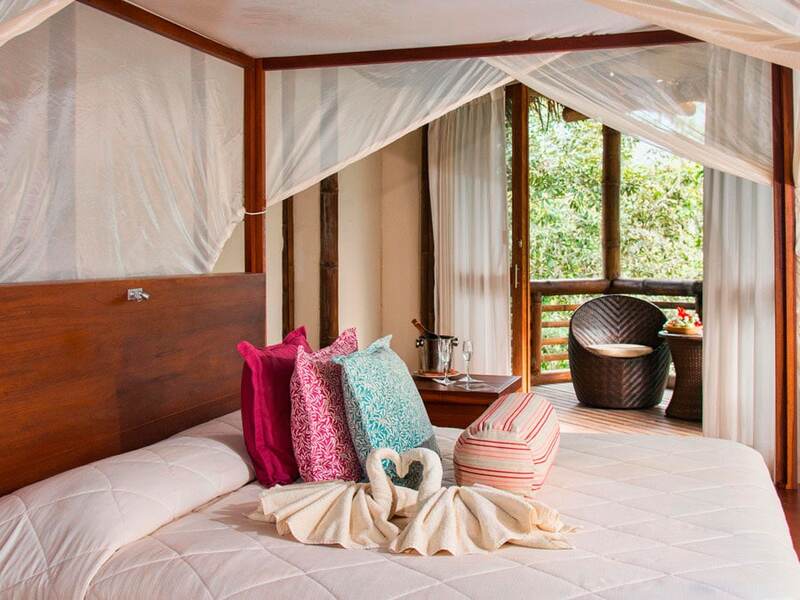 Afternoon Tea for two on the Jungle Perch completes your Dreamtime package. 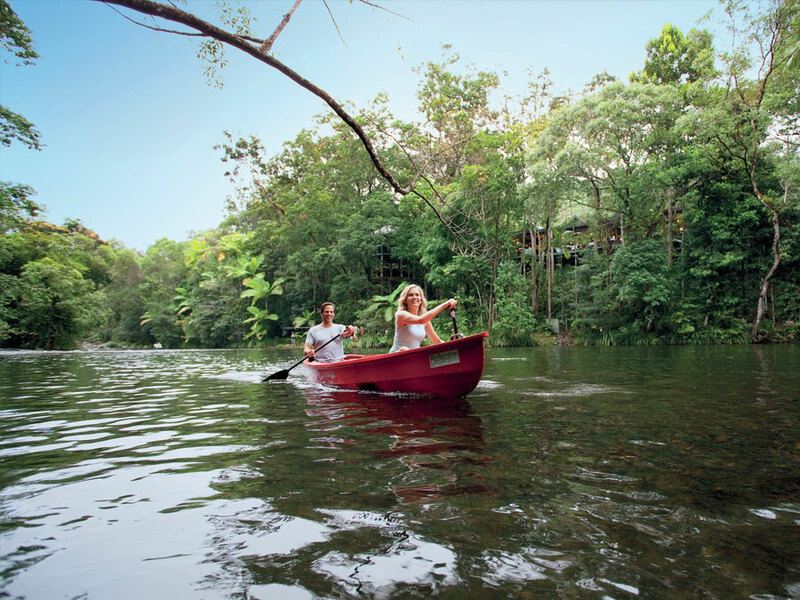 Complimentary lodge inclusions: Nightly Turndown, Yoga, Guided Rainforest Walk, one return shuttle daily to Port Douglas, Free Wifi in the main Lodge, use of river canoes, bikes, tennis court and fitness centre. 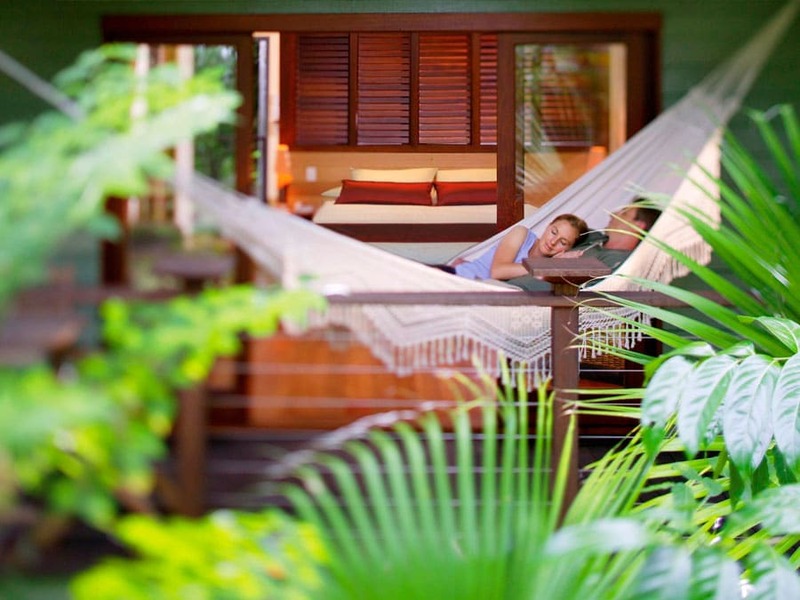 A Perfect Daintree Escape in Tropical North Queensland. Escape to the secluded luxury of Silky Oaks Lodge, Australia’s premier luxury lodge from which to discover Tropical North Queensland. 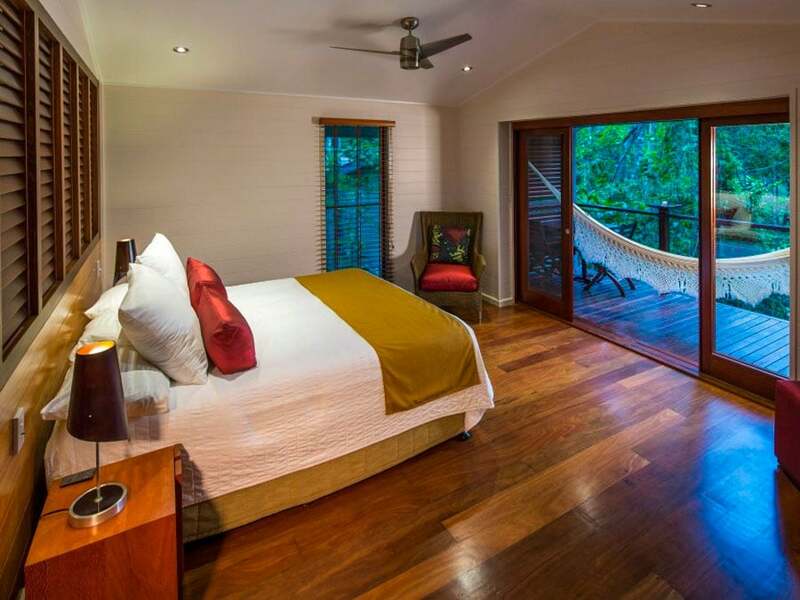 Spectacularly situated on the Mossman Gorge River and within easy access from Cairns and 15 minutes from Port Douglas, the lodge is the ideal location to appreciate the natural tropical environment. Explore and experience with our Explorer Package where you will immerse yourself in the magic of the World Heritage listed Daintree Park and relax and rejuvenate in the Healing Waters Spa. 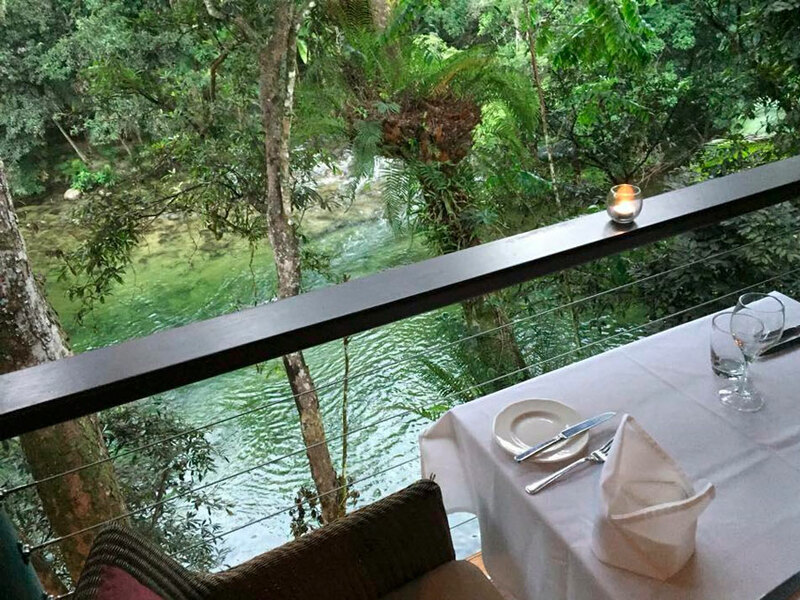 Dine on gourmet, locally sourced produce, each evening, in the open sided Treehouse Restaurant which perches high above the surrounding rainforest and river. The best of both worlds’ reef and rainforest. Three nights luxury accommodation, gourmet breakfast, dinner, return transfers from Cairns, one full day out on the magnificent Barrier Reef and one full day in the magical Daintree and Cape Tribulation. 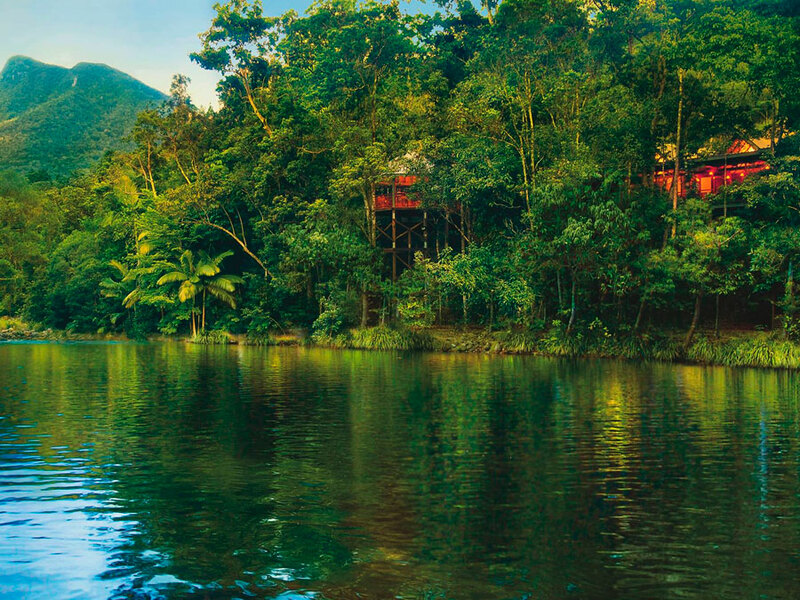 Surrender yourself to the spirit of the Daintree – the oldest living rainforest on Earth. Our four night spa package is designed to provide balance, renewal, vitality and well being. Enjoy four nights accommodation including breakfast, lunch and dinner daily. Relax and rejuvenate at the Healing Waters Spa, with three of our signature treatments that have been designed to enhance body and soul. Indulge in our luxury package where every wish is fulfilled. Enjoy four pampered nights in a Billabong Suite, return luxury private transfers from Cairns, Dom Perignon on arrival, all gourmet meals with choice of location at the lodge, Helicopter tour, luxury purity and detoxifying ritual at the Healing Waters Spa and a private Daintree Safari. In order to secure your reservation you will be required to supply credit card details. Rest assured, your credit card will not be charged prior to arrival. You may also pay by direct debit prior to arrival. Only on check-out will you be required to make payment for your stay or if cancellation falls inside our cancellation policy, your credit card will be charged with the cancellation fee plus a transaction fee of 1.5%. CANCELLATION FEE APPLIES Within 72 hours of arrival: cancellation of any rooms, all pre-booked meals, pre-booked spa treatments or pre-booked transfers held incurs a cancellation fee of full contracted rate per confirmed room per night, all pre-booked meals, pre-booked spa treatments and prebooked transfers.